We came to know Bob when he approached us in October, 1995 at the Museum of Science and Industry in Chicago where our encounter support group, in conjunction with MUFON, CUFOS, and Operation Right To Know, sponsored lectures by researchers and experiencers to raise public awareness during National UFO Awareness Week. Bob told us about the close encounter he had in June, 1963 which was investigated in 1983 by J. Allen Hynek and Mark Rodeghier of CUFOS. We invited him to join us at our next support group meeting and from then on he was an integral part of our monthly meetings. He was the glue that held things together and helped other members feel more comfortable talking about their experiences. Bob had many different types of cameras and loved to take photos of people and landscapes wherever he went. The stunning portraits he took were truly amazing. On several occasions when Bob bought a new camera, he would give one of his old cameras to someone he knew would appreciate it. Bob was an ardent scholar of cosmology. I truly believe that his favorite pastime was studying the cosmos and learning everything he could about all the galactic formations that have been catalogued to date. He loved seeing new photos of these formations and the details which had heretofore been unknown. He felt a strong connection with the universe and a special planet in particular. 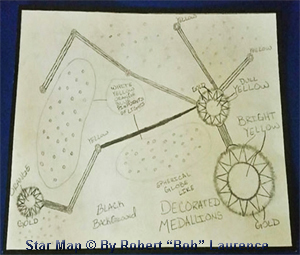 Bob drew a star map while CUFOS was investigating his case which indicated a possible home planet of the greys who contacted him. 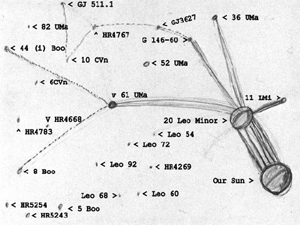 Bob Laurence’s Drawing of the Star Map. Steve Pearse’s Star Map which combines the Hill Star Map and specific directions given to Erik by the Grey who described the location of their home world as viewed from Earth. 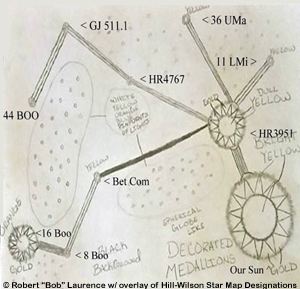 Overlay of Bob Laurence’s map with the Hill-Wilson Star Map shows striking parallels. Things did happen at these contact sessions although we couldn’t be sure of the cause or the source. For example, during our first attempt at contact, an orange light appeared above one of the participants, Sue. Later, I became encased in an orange bubble which healed a rash I had had for months. Neither of us was aware of the orange lights around ourselves, only around the other person. Bob felt compelled to go outside where he saw a tall, brightly-lit craft standing vertically. He seemed to be gone a long time and we were concerned and a little bored but not brave enough to go out to check on him. When he finally came back in, he announced that he was no longer afraid. We didn’t realize he had been afraid earlier. 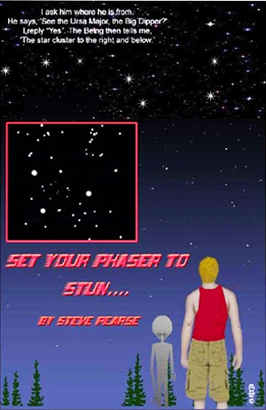 The next thing recorded was a small ball of light which swooped down from the ceiling to the floor then rolled along on my right side straight for a pair of shoes, Sue’s, in its path. When the light encountered the shoes, it stopped and carefully, with intent, went around them then continued on its original path toward Molly who had been watching all of this. When the light was less than a foot from her, she jumped out of the way then came back and snuggled with me when the ball was out of sight. None of us were aware of the ball of light which had been captured on tape. In the morning after awakening, Bob painstakingly went through the entire tape looking for anomalous events and came upon the incident with the light. Although Bob would generally review a tape on the morning after a session, not all tapes were reviewed since the process was so time-consuming. We assumed, wrongly, that if something noteworthy had occurred, we would have remembered it. Also, we seldom inserted a second tape after the allotted time had elapsed on the first. That, along with the tapes that were never reviewed, left a gap of many hours unaccounted for. Again, we were not certain what the anomalous activity we did record might represent. There were four of us left after our meeting broke up: Bob, Nellie, Diane, and me. Bob and Nellie were standing next to each other near the foyer stairs at the east end of the living room. Diane was sitting on the sofa on the west end of the room, looking eastward toward Bob and Nellie. I stood in the center of the room facing Bob and Nellie with Diane to my back. As I was speaking to Nellie, I saw her eyes widen and her jaw drop as she looked up at the ceiling. Before I could ask her what she was looking at, Bob yelled out: Did you see that, did you guys see that? Nellie immediately confirmed that she had, then she and Bob began comparing notes on what they had seen. Each saw a portal open in the air, facing east, next to my right side. Standing in the opening was a tall being clad in a brown robe and hood. After two or three seconds, the portal and figure vanished. Bob and Diane both agreed that the encounter was preceded by the appearance of brownish smoke along the ceiling mixed with tiny, sparkly lights under which the portal opened. I did not see the portal, nor did Diane. I had at first assumed I didn’t see it because it was on my blind side but then remembered Michio Kaku’s description in his book Hyperspace of what a wormhole would look like to outside observers. Viewed from the edge on, the wormhole would be invisible which might explain why I was unaware it had opened beside me. Bob and Nellie both said they experienced a strong telepathic exchange with each other when the opening first appeared. This event is significant because there were not only the two primary observers, Bob and Nellie, who saw exactly the same thing but an additional independent eyewitness, me, who was not directly involved but saw the expression of shock on Nellie’s face which tends to corroborate her and Bob’s accounts. Adding to the importance of this event is that the same portal had opened before in exactly the same location but in the opposite direction, facing west instead of east. I tried entering this portal to rescue my younger son Ian, but my path was blocked by a being who held my hand. I then tried to penetrate the barrier with only my consciousness, but was blocked by his mind. This earlier occurrence of the portal was part of an extended encounter involving my entire family. 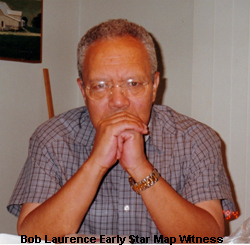 Bob mentioned something about his 1963 encounter which provides a clue regarding the nature and purpose of the beings who contacted him. Bob said he asked a female being: Why am I here? The being said that Bob was a seed; that there are many seeds; that some seeds are defective and will die but Bob was not defective. She said that seeds need to be tended and nurtured throughout their lives. From Bob’s account, I assumed that the purpose of nurturing the seeds was to enhance the evolution and consciousness of humankind. 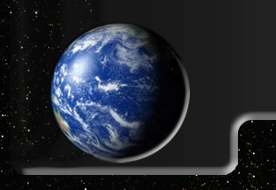 Period of Rotation: 2-3 Earth days? I have read a number of beautiful eulogies for Robert. I would just like to add mine. I am his first cousin. He was two years older than me, so I have known him all my life. He was one of the nicest persons I have ever met. I don’t think there was a mean bone in his body. We have always been kind of close. One day he told me he wanted to tell me a story that he said he knew I would not believe. He told me about his alien encounter. He was shocked when I told him that I believed him. Who am I to say what’s out there and what isn’t? I think we became closer from that day on. Robert was a brilliant man. He knew so many things that were “Greek” to me. He knew so much about mathematics. I can hardly balance my checkbook. When he started talking about math, I could feel my eyes glaze over. He knew so much about everything: astrology, calculus, physics, cosmology, I could go on and on. But through it all, we could converse. My forte was English. 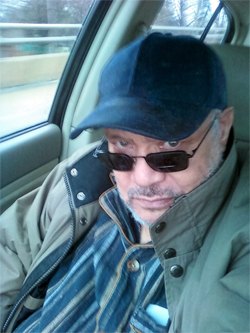 I was a court reporter. We had great conversations together. As he would say, “All things are relative.” I would say we learned a lot from each other. I am so glad for the past couple of years we got to spend together. Although we were cousins, he was like the brother I never had. I will miss him very much. Robert had beautiful friends, lifetime friends, but I guess beautiful people are supposed to know beautiful people. Over the past couple of years, we spent a lot of time together and he told me beautiful stories about them. They loved him dearly also! I hope to see you again one day, Robert. Until then, you will remain in my heart! I’ve been trying to put my thoughts and emotions together since Bob Laurence’s passing in such a way that I could bring together the exact words I want to express for this eulogy. Bob lived in a virtual hell for the past 10 years that in no way did he deserve. There are many things we don’t want to let into our lives . . . to put them in a box and never let them out . . . try to escape the pain and sadness that we don’t want to feel. As I sit here writing this, that’s what I want to do. I don’t want to face his passing and I may never fully wrap my mind around it. There is a saying we all know, “Only the good die young.” Bob is proof of this. He was just too young and too good of a person to pass. He had much more life to live and adventures to experience. 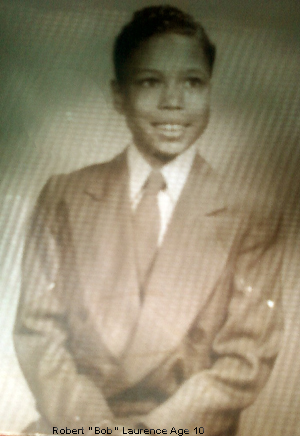 As some of you may know, Bob’s experiences started when he was a child and have been a major part of his life. In his adult years, he’s been investigated, hypnotized and even drew a star map that he remembered from an encounter. He drew this map for Mark Rodeghier and J. Allen Hynek. To use a political term now often heard . . . he was thoroughly vetted by those investigating his experiences and found believable. I met Bob at a UFO conference at the Museum of Science and Industry back in the 1990’s that Mary Kerfoot had organized. I remember seeing him wandering around a little and then we spoke for awhile, exchanged phone numbers and from that point on we became very close and loving friends. Mary, Bob and I would spend many hours discussing encounters and speculating what it all meant. After a couple of years, I became part of many of his encounters. He would call me in the morning and ask what I had remembered from the night before, which was nothing, but he could tell me what I was wearing during the encounter, which was correct. For whatever reason, he was allowed some memory and I was not. But the very best was that Bob, Mary and I also just hung out as everyday friends doing so many fun things that can only now live in our memories. One Easter Sunday, Bob called me about an encounter I didn’t remember, which included Bob, myself and my youngest granddaughter, Lexi, aged about 8 at the time. I want to stress here the importance of this because I have two granddaughters who know nothing about abductions, UFOs and the like. I never discussed any of this with them, so I can honestly say they were totally clueless about all of it. So, after I talked to Bob that particular Easter morning, my family came over for dinner and my granddaughter Lexi came up to me to tell me about this really strange dream she had the night before that was pretty much what Bob had told me earlier. This was such a shock, but yet such an important, independent encounter validation that I could hardly believe it. There’s no way she could have made this up. I told Bob about Lexi later in the evening and he was as stunned as I was, but we were both totally amazed at what a revelation this was. However, and I saved this part for last, I want you to know that there was so much more to Bob that made him who he was other than just his encounters and UFOs. He was also a man who had an extraordinary life. Many of you may not know that he was absolutely brilliant. He graduated from the University of Illinois with a B.S. Degree in Aerospace Engineering and then an M.S. Degree in Celestial Mechanics. All of this eventually led him to work for NASA with a team of engineers working on the heat shields for one of the shuttle series. He then taught physics and advanced math at a college prep school in Chicago named Kenwood Academy. He taught there for years when NASA contacted him again to be a mentor to the younger Engineers who were going to start working on the NASA Mar’s project that was just beginning. He declined this offer because he felt he had been out of the field too long, too much had changed and because of his age, but what an honor. These accomplishments and more Bob probably wouldn’t have told you. That wasn’t his way. He was too humble to brag or talk much about himself. Bob was very down to earth and, outwardly, just an ordinary man who was, at the same time, very exceptional. He was kind, generous, loving and fun-loving, mischievous in his own way from the stories he told us, loyal and never had a bad word to say about anyone. He would give you the shirt off his back if you needed it. He also had several passions, the least of was cameras that he bought up like candy, which coincided with a deep interest in medium format photography, both film and digital, right up to a very highly intellectual and intense interest in mathematics of special and general relativity and quantum mechanics. On the non-academic side of Bob, he loved cars and he loved to travel. Bob was actually going to treat us all to a month long trip to Europe. It was going to be a surprise for Mary and I, but illness struck him down hard. I was really looking forward to spending a lot of time with him after I retired, but that was not to be, and will be something I will always deeply regret. When the slogan, “Character Counts” came to be, Bob was their model of what character means. Someone very meaningful to me is now gone, but only in body, not in spirit. So, my dearest Bob, these final words are from me and those who love and miss you most. Deep in the stillness, we can hear you speak, you’re still an inspiration, can it be? That you are ours’ forever more . . . and you’re watching over us from up above. Fly us up to where you are beyond the distant star. A breath away’s not far from where you are. Are you gently sleeping here inside our dreams, and isn’t faith believing all power can’t be seen? As our hearts hold you, just one beat away, we cherish what you gave us everyday. Bob was African-American, and living on the south side of Chicago, must have regularly faced discrimination, but he never mentioned it. His race made me think at times of Barney Hill, each well-spoken gentleman who had something utterly unanticipated happen to them.